Go pro with a Hatsuyuki HC-8E Cube Ice Shaver. 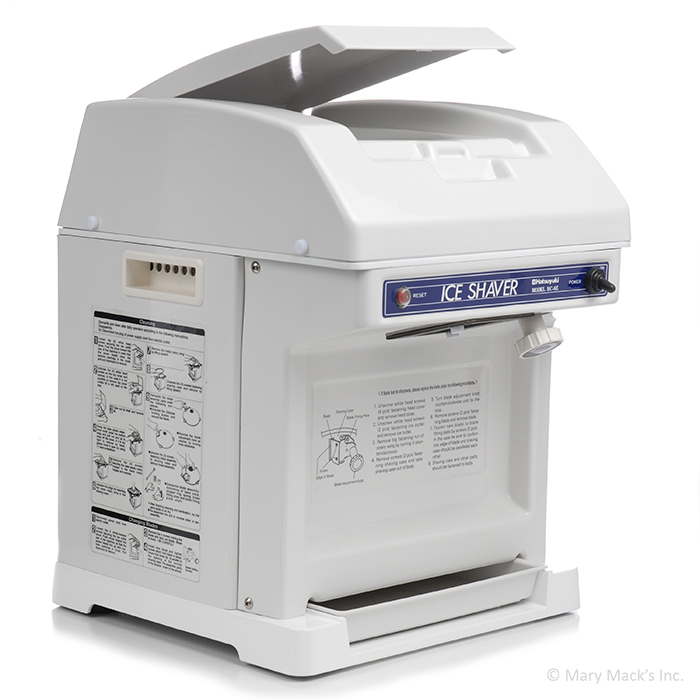 With a 110-volt industrial-strength motor, this electric shaved ice machine can serve up to 400 people in an eight-hour period; that�s why it�s one of our hottest sellers. Since this portable machine can turn ordinary cubed or bagged ice into a light, fluffy snow in a matter of seconds, the Hatsuyuki HC-8E is perfect for shaved ice startups. With a safety switch and a large drip pan, this model is the smart choice for any professional commercial operation. 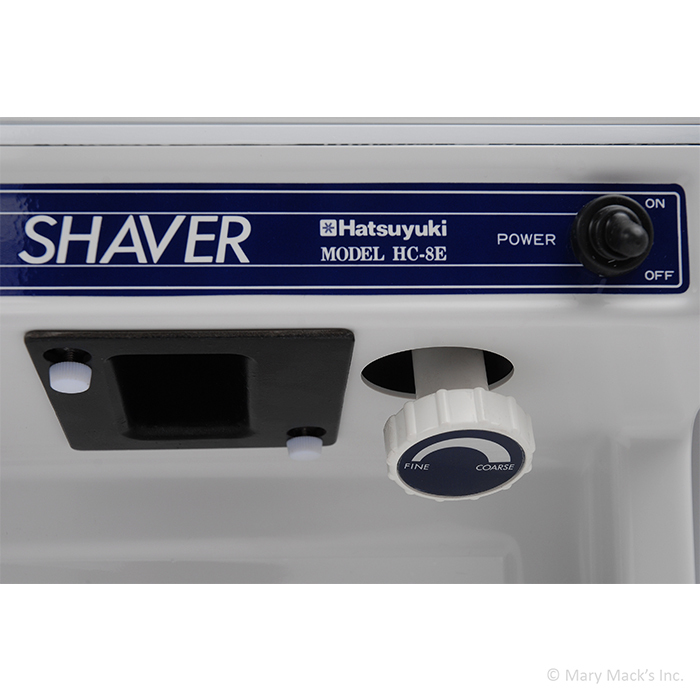 The Hatsuyuki HC-8E features a blade adjustment knob located on the front of the machine. This allows the operator to adjust the texture of the snow to your liking, very fine to very coarse. An important safety feature prevents the machine from being operated while the lid is open. Purchase this machine with one of our many flavored syrup packages and start your shaved ice business today! The HC-8E will provide years of service for any shaved ice business. For questions regarding this machine, click on the FAQ tab above. If you don't find what you're looking for, feel free to give us a call anytime at 1-800-620-2869 or email us at customercare@hawaiianshavedice.com. Be sure to ask us how you can get a copy of the book Cold Cash, our FREE 110 page shaved ice business manual. It gives you all the ins-and-outs of the shaved ice business. Install the Hatsuyuki HC-8E on a sturdy, level, and waterproof surface. Be sure to use a grounded, three-prong 115V electrical receptacle and keep water away from the electrical portions of the machine. 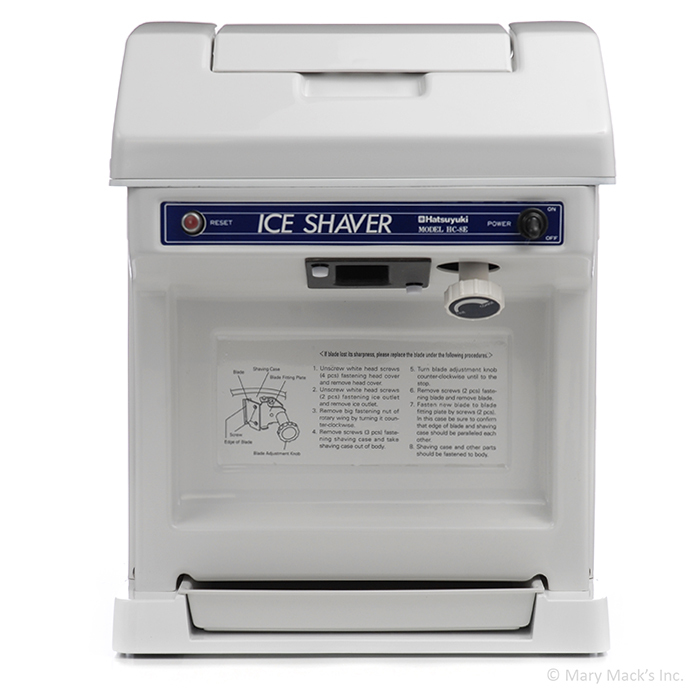 To operate the ice shaver, use an ice scoop and fill the hopper with cubed ice. Next, close the lid and turn the blade adjustment knob counter clockwise until it comes to a stop. Flip the on/off switch on the front of the machine or easily step on the optional foot pedal. The shaved ice will start dispensing immediately. Slowly turn the blade adjustment knob clockwise until you reach your desired ice consistency. Simply catch the shaved ice in your desired serving container, add your favorite Hawaiian Shaved Ice syrup and complete it with a spoon straw or a plastic spoon. To stop shaving ice, remove your foot from the foot pedal or simply move the on/off switch to off. To clean your machine, first, disconnect the power cord from the socket. Loosen the two white-headed screws which secure the ice outlet chute. Pull downward to remove. Next, unscrew the four white-headed screws on the top cover and remove. The top cover cannot be removed unless the lid is fully open. Go ahead and pull out the lid connecting shaft and remove the lid. 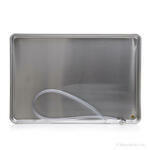 Grip the clear plastic water-seal cover by this bottom edge and pull out and up to remove. If it's too tight and you struggle to remove it by hand, pry up carefully with a screwdriver. Remove the screws which attach the clear plastic rotary hopper to the metal rotary hopper. Remove the plastic rotary hopper. Unscrew and remove the large nut which attaches the metal rotary wing to the shaving case. Lift the metal rotary wing upward to remove. Remove the three screws which fasten the conical shaving case and life upward to remove. Remove the two screws which attach the shaver blade assembly. Simply wipe down the machine parts and with a clean, dry, soft cloth. You may use a damp cloth with diluted dish detergent. Do not clean any parts with harsh detergents, solvents or abrasive cleaners. You can use the same solution for the exterior of the machine. To re-assemble, simply follow the above instructions in reverse order. We recommend changing your blade every 2,000-4,000 servings. One spare blade is included with your machine and additional blades may be purchased when adding the machine to your shopping cart. To change the blade, first, disconnect the power cord from the socket. Loosen the two white-headed screws which secure the ice outlet chute. 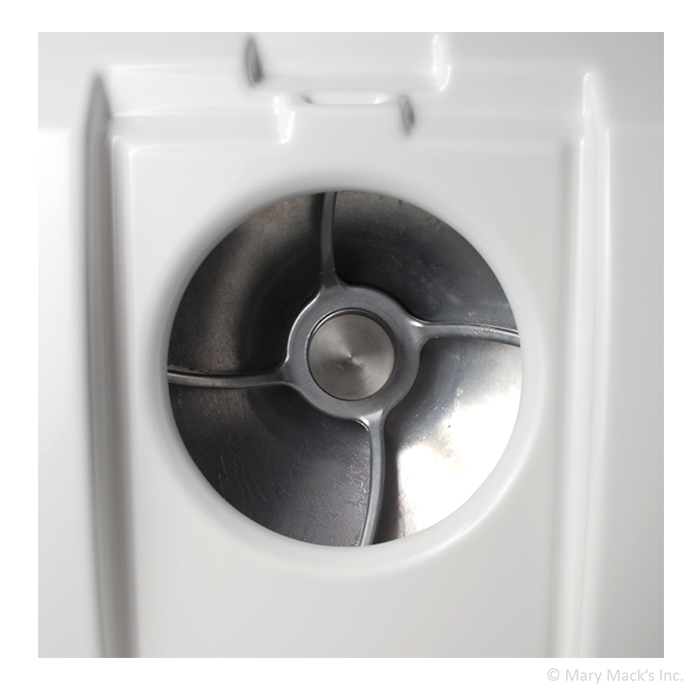 Push the chute toward the rear of the machine so the screw heads line up with the key-hole openings in the chute. Pull downward to remove. Next, remove the two screws holding the blade and pull out the blade making sure not to cut yourself. Install the new blade and tighten the screws which hold the blade in place. Ensure the blade tip is parallel to the opening of the conical shaving case. Reassemble the parts in reverse order as above. I'm interested in starting a Shaved Ice business. Is this a good machine to use?? Absolutely! 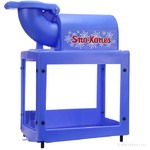 This is, by far, our most popular professional shaved ice machine. Great! 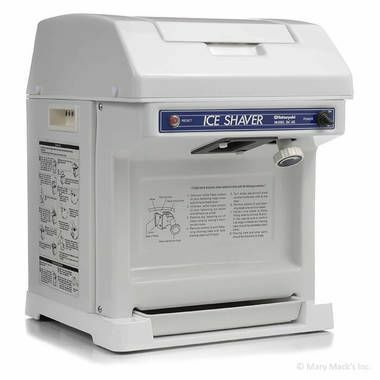 What type of ice does this machine use? Can I make my own ice or do I need to purchase ice?? The HC-8E machine uses cube ice that is one inch or larger. The flake ice, pellet ice or block ice cannot be used with this machine. If you're feeling ambitious, you can make your own ice. If you're looking for a time-saver, you can purchase ice from your local ice supplier. You may also purchase bag ice from a local grocery or convenience store. Do you recommend a drip pan with this machine? What's the difference between this and a regular pan? It's like a floor mat in a new car. We do recommend you use a drip pan underneath the machine to help catch the excess ice and reduce mess. This definitely helps when cleaning up at the end of a busy day. You may choose to include this in your order when adding the machine to your shopping cart. The difference is simple; the pan has a drainage hole and hose to guide the water into your designated drain or bucket. Trust us - this makes cleanup easy-schmeezy. Speaking of drips, is the ice hopper insulated? Unfortunately, it's not insulated. We hope you'll be busy enough that your ice won't even have time to melt! That's fine - I just won't put so many scoops in the hopper! If I am busy, how many servings will the hopper hold? The HC-8E has a good-size hopper. You can fill it with about three pounds of ice and make 8-9 servings (about 8 ounces each). That�s 8-9 happy customers! Do you think I should purchase the foot switch with this machine? Would you rather have two hands available? Keeping both hands available is not only safer, it's also more time efficient - this helps when you have a long line of anxious customers. One hand can hold the cup, and the other hand can pour the syrup on the cup. You may choose to add this to your order when adding the machine to your shopping cart. How often do you suggest changing the blades? Please don't tell me daily. Whew - absolutely not daily. We suggest changing the blade every 2,000 to 4,000 servings to keep a consistent product. Good news - this machine includes a spare blade! We have additional blades which can be purchased in the future when you need them. Can this machine be converted to a battery? Is it available in 220 volt? Because the battery operated motors are different, this machine cannot be converted to battery. 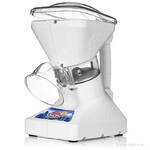 However, we do sell a battery-powered version on our commercial website, www.1-800-Shaved-Ice.com. This machine is not available in 220 volt. I plan on using this machine all over town. Is it easy to transport? Can I use a generator? If you can lift 50 pounds, you're good-to-go. This machine weighs 47 pounds. There's no need to secure it permanently to a table. Just find a flat and sturdy table and you'll be good. You can use a generator if you'd like. Please use a generator of more than 1,200W capacity. Also, when shopping for drop cords, don't buy a cheap one. 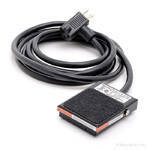 Find the shortest heavy duty cord you can find to avoid ruining your motor. If you're feeling adventurous, you can just pull your HC-8E in a custom Concession Trailer. Is this machine UL listed and NSF approved? You bet! This machine was made with safety in mind. Don't worry about this machine - it's been tested by professionals and owners worldwide! Can I finance this machine or rent it from you? We do not have financing options and suggest you visit your local financial institution. However, we do rent this machine to local customers. We are in North Carolina and the machine must be picked up and returned from our location. Unfortunately, we do not ship rental machines.